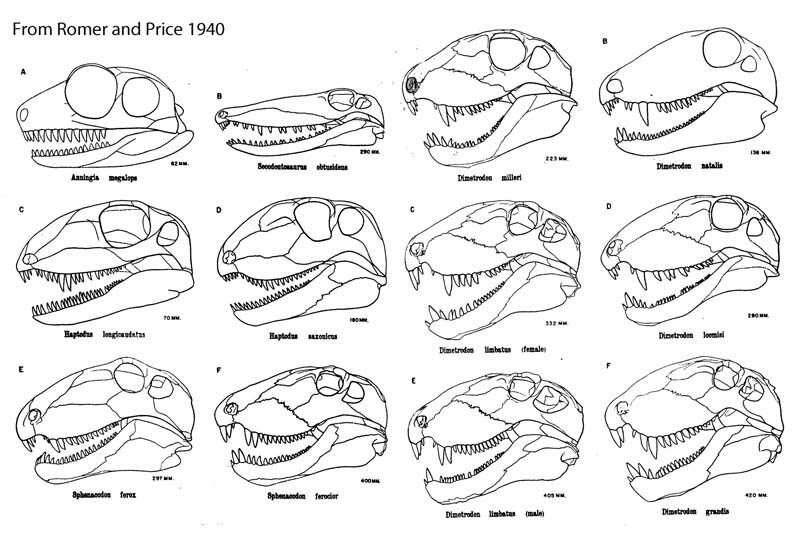 Yesterday we looked at ophiacodonts from Romer and Price (1940) and showed them to scale. Today we’ll do the same with sphenacodonts (Figs.1,2). Figure 1. Click to enlarge. Sphenacodont pelycosaur skulls from Romer and Price 1940. 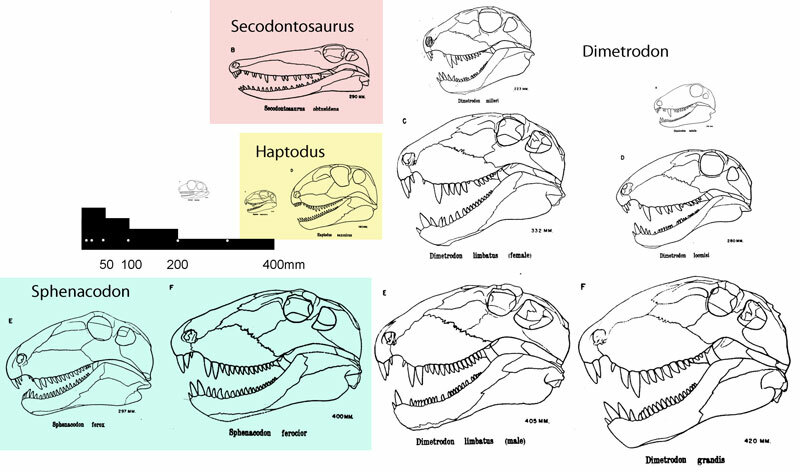 Notice how similar the skull of sail-less Sphenacodon is to that of Dimetrodon. Little Anningia was shown to be undiagnosable by Reisz 1992. D. natal is is evidently the baby Dimetrodon. If so most of the skull is imaginary here. It’s a different picture, isn’t it, when scale is applied to illustrations. Figure 2. Click to enlarge. Sphenacodont skulls to scale. Paleontologist Alfred Romer erected the species Dimetrodon natalis in 1936, previously described as Clepsydrops natalis. D. natalis was the smallest known species of Dimetrodon at that time, and was found alongside remains of the larger-bodied D. limbatus. Sternberg (1942) didn’t mention it in his description of an “immature Dimetrodon cf. grandis,” which is a different and smaller specimen, the baby Dimetrodon found here. Secodontosaurus is the oddball here, but the postcrania is indistinguishable from Dimetrodon. More on that one later. Brinkman D 1988. Size-independent criteria for estimating relative age in Ophiacodon and Dimetrodon (Reptilia, Pelycosauria) from the Admiral and lower Belle Plains formations of west-central Texas. Journal of Vertebrate Paleontology 8 (2): 172–180. Reisz RR, Dilkes DW 1992. The taxonomic position of Anningia megalops, a small amniote from the Permian of South Africa. Canadian Journal of Earth Sciences, 1992, 29(7):1605-1608. Sternberg CW 1942. The skeleton of an immature pelycosaur, Dimetrodon cf. grandis, from the Permian of Texas. Journal of Paleontology 16 (4): 485–486. This entry was posted in pelycosaur, spenacodont, synapsid and tagged pelycosaur, sphenacodont, synapsid by davidpeters1954. Bookmark the permalink.